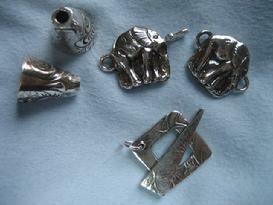 Prior experience in working with metal clay is required. The basics will not be covered in these classes. 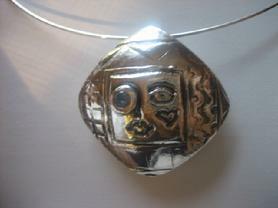 Click on Metal Clay Class Calendar Tab for Class Schedules and Locations . Private and small class instruction is available as well. (Please see Private Classes Page for more information). Toggles, Cones & Clasps: 5 hrs. instruction, (instructor will fire-arrange final finishing during shop hours). Add another dimension to your jewelry making. 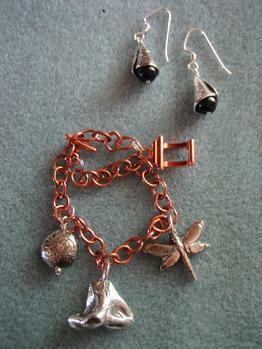 Design your own toggles, cones, and clasps for your beautiful bracelet and necklace creations. Previous Metal Clay experience is necessary. Supplies: 1 Package 24 grams PMC 3 or Art Clay 650-slow dry-low fire, 1 Foot Fine Silver Wire, 1 Sterling Silver Jump Ring 18 gauge 3.5 mm ID (toggle), 1 Sterling Silver Jump Ring 18 gauge 4-6 mm ID (Toggle). Option: 1-20 Gauge 4-6 mm ID Sterling Jump Ring (Neck Clasp). 2-20 Gauge 3.5 mm ID Sterling Jump Rings (Neck Clasp). Class Information: Please see Metal Clay Class Calendar Page. 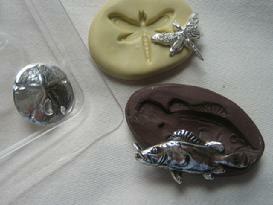 Make Your Own Molds: (3 hrs instruction, instructor will fire pieces-arrange final finishing during shop hours). 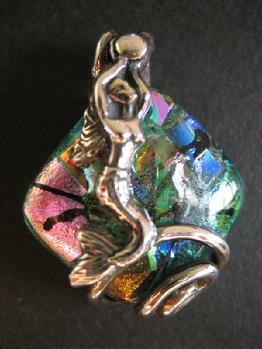 Do you have an antique button, sea shell or any found object (organic or otherwise) you wish to recreate in metal clay? Perhaps, to make a pendant, charm bracelet, a pair of earrings, or use as a design to top a ring band? Bring them to class and learn how to make your own molds from polymer clay, and 2 part silicone molding compound. 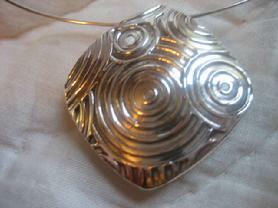 The class will also cover how to use commercial jewelry and candy molds to create your designs. Previous experience in metal clay is necessary. Dichroic Cabs Set in Metal Clay: (3 hrs. instruction, instructor will fire-arrange final finishing and pick up during shop hours). Bring your newly fired cabs to class or select one of ours, any size or shape. Learn how to design and texture a background in metal clay and set your chosen cab. You will also learn how to wrap your cab with a simple rope bezel to encase the cab and add embellishments. At least 3 different options will be demonstrated in class. Choose one or two and encase your cab in class. Supplies: Cabs, 1 package 16 g PMC or 20 g Package Art Clay 650. Please see Metal Clay Class Calendar Page. 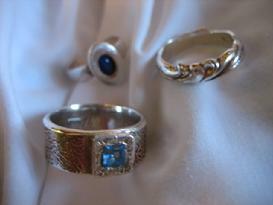 Flat Band Rings: (3 Hrs-includes firing by instructor-arrange final finishing during shop hours). Learn how to size rings in metal clay. Texture your band and add a CZ to the top of your ring. Instruction will include how to make and join a flat band ring. Previous experience with Metal Clay is necessary. Class: Please see Metal Clay Class Calendar Page. 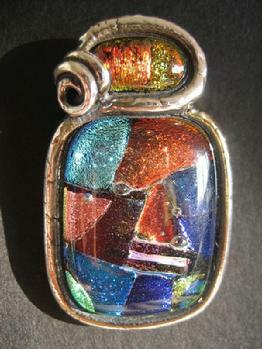 Domed Reversible Pendant: 7 hours-includes 1 hour firing by instructor. You will form, texture, and assemble a light weight domed pendant. 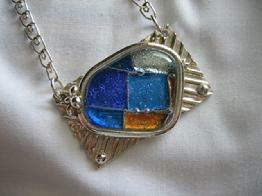 Using a different texture on each side will allow you to reverse your pendant according to your outfit or mood. Two pendants for the price of one! Knowledge of Metal Clay necessary. Supplies: 1 Package 24 grams PMC 3 or equivalent Art Clay 650, 1 Round magnetic end neck wire: (ends must be small enough to pass through pendant openings). 1 - 4 mm CZ. Hollow Charms and Earrings: (6 hrs. instruction-Charms will be torch fired and assembled in class). The hollow bead class offers 3 techniques in hollow form making. The hollow forms will be made without using cork clay as an armature. A draped bead is formed over a copper wire armature, a two sided lentil bead is textured and domed over a small form. The earrings are formed over a cone shaped armature. Two part silicone molding compound will be used to make an impression of a favorite button or charm you would like to recreate in silver. Once you master these techniques in a small charm, you can use your new skills to make the same designs into larger pendants, bracelets and earrings. Setting Non-Fireable Stones and Pearls in Metal Clay: (2 evenings-first class is 3 hrs. Second eve. 2 hrs. to place pearl, stone, and complete finishing. In this class we will be using pre-made fine silver stone mounts and fine silver wire to set a pearl and a faceted stone after firing. The pendant will be a heart outline shape...one side of the heart will be textured like bark. Instruction will include how to create a mirror finish on the other half of the heart outline. Previous metal clay experience is required. 20 Gauge Fine Silver Wire 1 "
Copper Sunflower Pendant: (6 hrs. instruction, instructor will fire pieces). Arrange final finishing during shop hours. The new Copper Clay is now available! 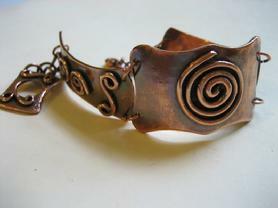 In this class you will learn how to cut, texture, and layer copper clay into a beautiful pendant. Since the firing schedule is several hours you will leave your creations at the shop for overnight firing. Information discussed in class will include: Firing Schedules, Firing tools and Equipment, Torched fired patinas and adding a patina with LOS. Linked Cuff Bracelets: These linked cuff bracelets are great projects for the beginner as well as the advanced metal clay student. 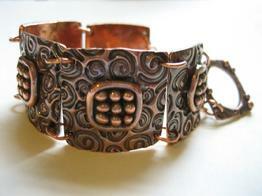 In this class you will learn how to finish and form bracelet links. Make embellishments with rolled coils to add texture. A toggle clasp, designed by you will complete your bracelet. Supplies: 100 grams Copper Clay, 2 feet 18 g copper wire for jump rings.